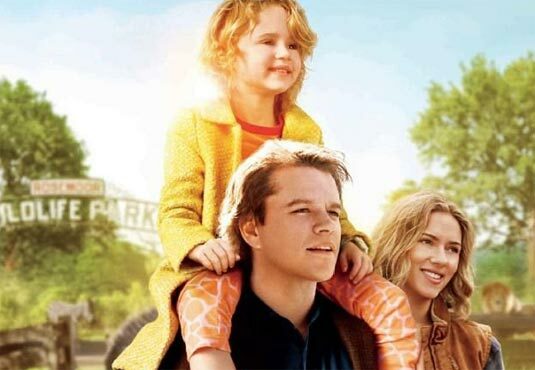 Matt Damon proves the best sort of family man dealing with grief in this feel-good film, We Bought a Zoo. Despite the inane title and its cutsie repeat as mantra, this movie rolls along sweetly in so many ways. Relationships float into each other. Conflict is not the name of the game. Jonsi’s music transports us. It’s euphoric. His long-building melodious tones feel like triumph, like a hug, like forgiveness in action. It almost feels like they tried to make this movie around the music. Sadly, the spoken words could not compare to the soundtrack. Two parallel trains…two separate destinations. The story felt conceptual rather than event-driven. Like a cooking show if we actually took the time to watch the chef chop and measure it all then wait calmly for the goodness to bake. This film takes time to bake, and Damon’s character is certainly full of goodness. Handsome, gentle, sentimental, patient, consistent: the perfect man. Surreal? The daughter is precocious and perfect. The only miscast was perhaps the angsty artist son who was likeable but dull in the mix. Thomas Haden Church was a favorite. If only all of these sweet characters had been given believable lines and a memorable story plot. Fortunately, Cameron Crowe is a master at filming awe and knowing glances. This is a comfort film with animals, but we know in the end…it is all about the people.